Paul Freeman was born in Richmond, Virginia January 2, 1936 and grew up there. He studied both clarinet and cello, then earned a Ph.D. at the Eastman School of Music. A Fulbright Grant enabled him to continue his studies in Berlin. Maestro Freeman passed away on July 22nd, 2015. See blog post here. In 1996, he was appointed music director and chief conductor of the Czech National Symphony Orchestra in Prague, a position he holds simultaneously with his Chicago Sinfonietta post. From 1979 to 1989, he served as music director of the Victoria Symphony in Canada, principal guest conductor of the Helsinki Philharmonic in Finland, associate conductor of the Dallas and Detroit Symphony Orchestras, and music director of the Opera Theatre of Rochester, New York. A recipient of the Mahler Award for the European Union of Arts, Freeman is in constant demand as a guest conductor, having led more than 100 orchestras in over 30 countries. As one of America's most successful recording conductors, he has approximately 200 releases to his credit. His nine-LP series tracing the history of Black symphonic composers from 1750 to the present garnered a great deal of attention on the Columbia label in the mid-1970s. Black and Latino musicians account for about 3 percent of the musicians in American orchestras but about 30 percent of the Chicago Sinfonietta. Most orchestras have practically all-white boards of directors and audiences, but about a third of the Sinfonietta's board is non-white and about 40 percent of its audience is minority. Most orchestras rarely play music by minority composers, but the Sinfonietta integrates these works throughout its entire season. When it comes to diversity, this is an orchestra doing a lot of things right. 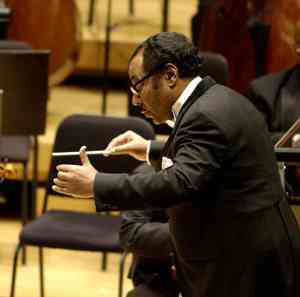 It should come as no surprise that its driving force is founding music director Paul Freeman, the widely-traveled African-American conductor who spearheaded a landmark series of black composer recordings for Columbia in the 1970s when he was resident conductor of the Detroit Symphony Orchestra. "It's a total committment," says Freeman, 69. "Often an attempt is made to integrate one or two areas of an orchestra's programs, but we do it at all levels - on stage, soloists, repertoire, the board and audiences. With a $2 million annual budget, the Sinfonietta employs professional freelance musicians and performs a subscription series of five concerts performed in pairs at Orchestra Hall downtown and at Dominican University in suburban River Forest. 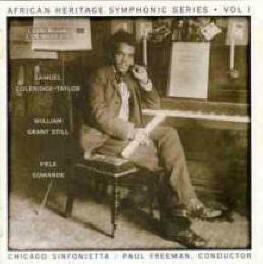 Most unusual for an orchestra of its size, the Sinfonietta has toured overseas five times and made a dozen recordings, including an African Heritage Symphonic Series for Cedille Records devoted to black composers. 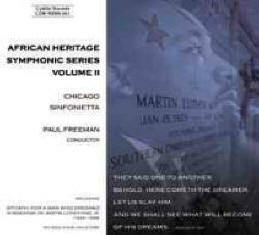 Freeman has called the Sinfonietta an affirmative action orchestra with no quotas and no numbers. He only selects players for the orchestra who meet the highest performance standards, and no one is displaced to make room for a minority player. 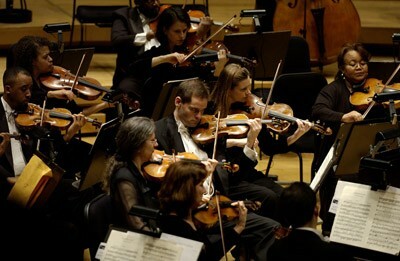 But the orchestra keeps an extensive list of substitutes who are black or Hispanic. When an opening comes up, preference is given to a qualified player on the list. William Grant Still (1895-1978), Symphony No. 1 (Afro-American) (21:10). 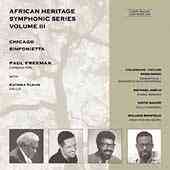 Coleridge-Taylor Perkinson (1932-2004) Generations: Sinfonietta No. 2 for Strings (19:20). Throughout this series he has presented several works by the outstanding African-American composer David Nathaniel Baker (a previous all-Baker disc is on TROY 377). A native of Indianapolis, Baker holds the position of Distinguished Professor of Music and Chairman of the Jazz Department at the Indiana University School of Music. The best pieces, though, are the two concertos, both of which deserve to be in the repertoire of every self-respecting trombonist or sax player. Paul Freeman has the Czech National Symphony playing with the necessary panache and rhythmic snap, and the engineering also is very good: warm and well-balanced.